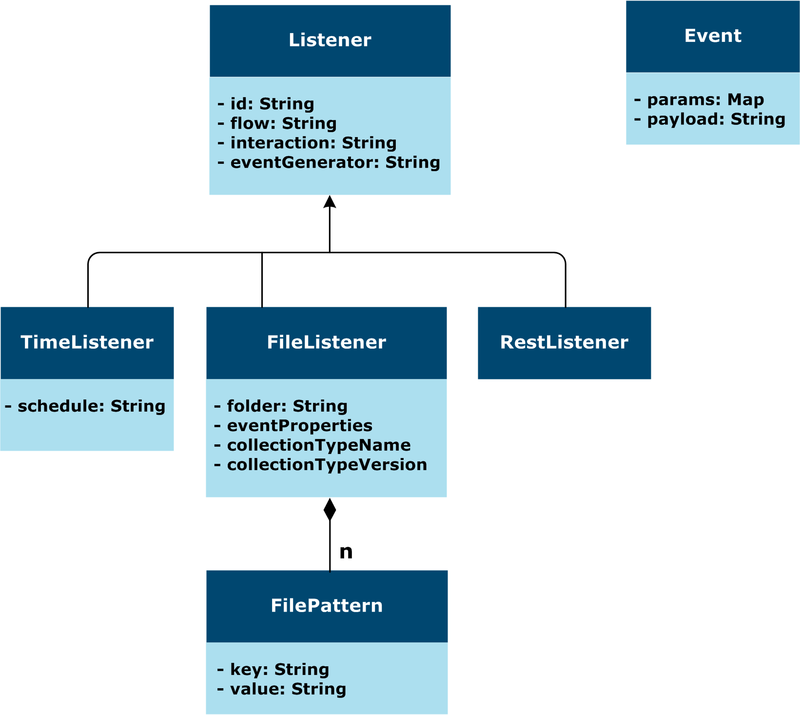 In order to trigger actions automatically using the Event Processor, the user needs to configure InterPlay and the other products or components that interact with it using Administration. The configuration is then stored in the registry. Default flow name for the generated event. A flow identifies a data exchange between at least two components without transformation of the payload. interaction String 30 Default interaction name for the generated event. An interaction identifies a set of flows. Listener waiting for a given time, one-time or recurrent. Waits for a file. When it gets it, it triggers the event. Folder (*) String 150 Listened folder. workFolder (*) String 150 Folder where the files are moved after being processed. Its path must be relative to the folder that is listened. Pattern that matches the file to find. collectionTypeName String 50 Collection Type used to import the file. Used only if the property file is not provided. collectionTypeVersion Int 4 Version of the collection type. For REST listeners, the properties found in the URL are added as properties of the event. They overwrite all the other properties. Resources are logical resources that can be referenced in rules, like folders. A resource is component-specific. Resources can change on the component depending on the environment. For information on how to define resources, see Manage resources. The actions that can be triggered by the Event Processor depend on the components involved. Each Event processor is configured to define the actions to trigger depending on incoming events and action results.